Don’t let that bandage fool you! This warrior has been in a few scrapes, but it’s clear from the grim determination in his eyes that there’s still a lot of fight left in him. He’s leaning on his staff because he’s a little winded. But the fire is still burning inside him. So he wants to have another go. He and what army? The one that just showed up. It’s standing right behind him. Oh, by the way: Kabbalists call the Nine of Wands tarot card the Lord of Great Strength. Drawing on the limitless energy on the moon in Sagittarius, this man is fighting for a cause he believes in! The staffs resemble a palisade, a defensive structure. This suggests that he is fighting on home turf, giving him an important strategic edge. Since this scene takes place on a theater stage, you are looking at a psychological process, not an actual upcoming battle. The Nine of Wands reminds you that this is not the time to quit the race. You have almost reached your goal, and there are vast, untapped reservoirs of energy left. Plus, you’re quickly discovering that you have more friends and supporters than you thought. The grey floor on which he stands represents stability, knowledge, and timelessness. They’re his traditions and principles. The staffs behind him in the Nine of Wands are arranged in groups of 5 and 3, referencing the Five and Three of Wands. In the Five of Wands, he learned how to assert himself. In the Three, he became successful by experiencing the world. It’s pretty obvious that he’s a doer and not a talker. The green mountains behind him represent obstacles he has overcome. They also symbolize his vitality and power. The large blue sky in the Nine of Wands shows that he can draw from enormous reserves of emotional strength. It also represents optimism. Things may look tough, but you’ve seen tough before. And you’re ready for anything that’s headed your way. You know this is your moment to shine. You’re driven by an unshakable sense of purpose. It allows you to tap into inner reserves others can only dream of. Some of these reserves come from the experiences you have made throughout life. You’ve learned how to succeed and how to deal with stiff competition. Others come from a sound understanding of your place in the universe. 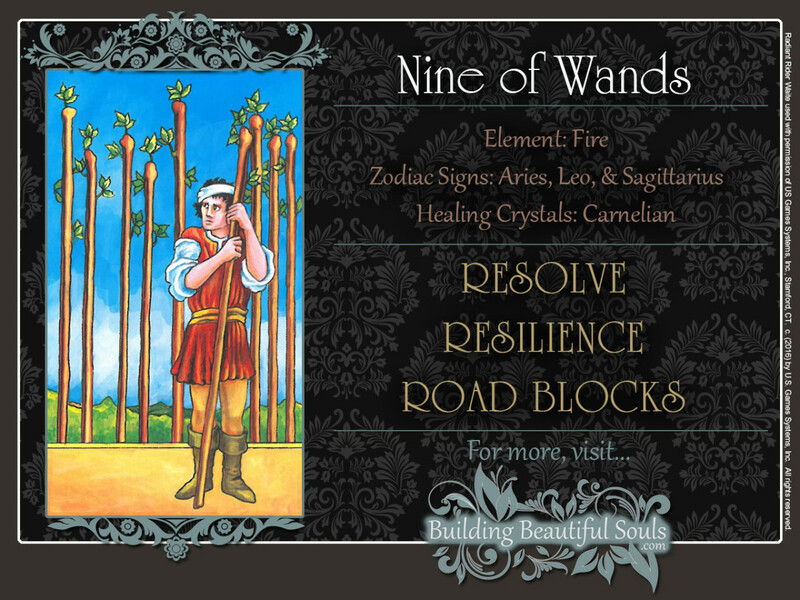 The astrological correspondence of the Nine of Wands card suggests that you are firmly grounded in the traditions of your family and culture – and perhaps in the traditions of your faith. Whatever challenges are headed your way, you already know what they are – and you’re ready for them. You know what resources are at your disposal and even better, you know who’s got your back and who doesn’t. While you’re hoping for the best, you have already planned for the worst. In a competitive situation or a possible conflict, others are likely to underestimate you. This will be their downfall. If you’re about to wrap up a project, expect some last minute hiccups that must be handled first. But no worries, you’ll handle them. You’ve come too far to quit now. Traditionally, the Nine of Wands spells good news if you’ve been struggling with an illness. Your doctor is likely to tell you that there’s a light at the end of the tunnel. But this particular tarot card is a bit tricky when it comes to questions about love. If it represents someone on whom you’ve set your sights, winning his or her heart won’t be easy. Past struggles and disappointments have made this person jaded over the years. This is someone whose trust must be earned. If the Nine of Wands card represents you, your loneliness may be of your own making. It’s not that no one is attracted to you. People are just having a hard time getting past all the walls you’ve built around yourself. Stepping outside your shell could be well worth the risk. When reversed, the Nine of Wands tarot card points to obstacles and delays which are often self-created. Okay, life isn’t always a bed of roses. But not every challenge you are faced with is a matter of you vs. the rest of the world. This tarot card can mean that you are being overly defensive or protective. Others may disagree with you. They may even be wrong. But here, you are encouraged to look at their side of the issue – even if it’s only for the sake of argument. Showing them that you’re willing to hear them out could generate more goodwill on their part than you think. It doesn’t hurt to take a peek at the other side. They may even have cookies! When the Nine of Wands card is reversed, it also suggests that you need to reach out to others for help. Maybe you’ve been putting things off for too long, and now your problems have become too numerous and too big to handle on your own. Or a sudden crises may have left you in a tricky situation. The good news is that help is out there. But you’ll need to swallow your pride and ask for it. Maybe you’ve been dealing with a demanding situation for some time. For example, a relationship may leave you emotionally drained. This is a good time to start thinking about whether it can still be saved, or whether you should cut your losses and end it. The choice that’s best for you depends on the other cards in the spread and the details of your situation. However, the Nine of Wands tarot card could also warn you that you’re taking things much too seriously. Are you making a mountain out of a mole hill? There’s a real possibility that all this will go away, if you can lighten up a little. Kabbalistically, nines are associated with the moon and its inexhaustible creativity. In traditional Numerology, 9 corresponds to feisty Mars. These energies combine in the Suit of Wands to tell the world it hasn’t seen the last of you.